Join the legendary Robin Hood and his band of merry friends in the most imaginative retelling of a classic fairytale! In this extraordinary adventure filled with off-beat antics and non-stop fun, Robin Hood must use his charm and wit to hit his target and win the ongoing battle against Prince John. 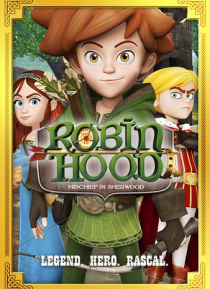 But when the infamous outlaw stirs up some trouble in Sherwood Forest, Maid Marion must teach the re… ckless Robin Hood what being a hero is all about!